Shiv Sena supremo Bal Thackeray, who had been critically ill for the past several days, was pronounced dead today afternoon. The 86-year-old cartoonist turned politician, known for his strong views and speaking his mind, sometimes bordering on the offensive, breathed his last at 3.33 pm. Within minutes of Bal Thackeray's death being announced, Mumbai went into lock-down mode with shops shutting down and vehicles going off the roads. 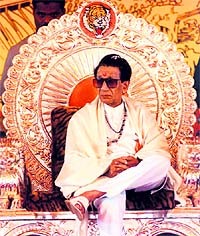 A big question mark hangs over the Shiv Sena after Bal Thackeray. As a personality-oriented party, the average Sena worker is simply not prepared to accept another leader. 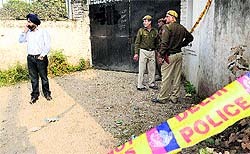 Gurpreeet Singh Chadha, alias Ponty Chadha, the man synonymous with liquor trade in north-India and for his political connection cutting across party lines, was shot dead. Gurdeep Singh Chadha, alias Ponty, and his brother, Hardeep Singh Chadha, had strong business connections with Punjab. The family�s political affiliations never came in the way of the growth of the Chadha group. In the second attack in the last three days in Jammu and Kashmir, suspected militants lobbed a grenade on a liquor shop in the Narwal area here this evening, killing one person and injuring five others. The police said it was investigating whether there was any similarity between the firing incident outside a liquor shop in Srinagar and today�s incident. 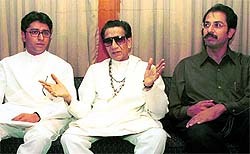 As Bal Thackeray himself once told an interviewer he would have stuck to cartooning if the management of the Free Press Journal, where he was first employed, had agreed to his request and allowed him to sit farther away from the office toilet! The budding cartoonist�s request was turned down and he quit in a huff to start his own publication, Marmik, inspired by the satirical magazine Punch.